My little family of four just returned Tuesday from a fun trip to Great Wolf Lodge in nearby Grapevine, Texas thanks to a generous Christmas gift from my parents. We had a blast! It's only about 40 minutes away, but we don't spend much time over on that side of town, so it was a great get away. I wasn't sure what to expect, but it was perfect for my kids at this age. With our bags packed before we left for worship Sunday morning, we left straightaway from the church parking lot. 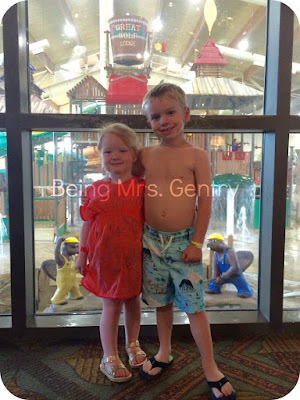 A quick stop for lunch and checking into our room by 1:45 had us in the waterpark by 2:30. Our oldest was tall enough to ride all but the biggest ride, and the ride range our little lady fit into was perfect for her abilities and mom's maximum comfort level! We spent hours in the water over the three day time period we were there--there was something for every age and ability. The waterpark was the main attraction, but we thought we'd check out the MagiQuest adventure too since we'd be there over the course of 3 days. If you've never heard of the game, you purchase magic wands and go on a scavenger hunt throughout the hotel, finding different items, completing different "quests" then graduating on to "adventures." The data is stored somewhere so you can use the same wands on subsequent visits to GWL and pick up your game right where you left off. The kids enjoyed the hunt, and it gave us something to do when we got a little too pruny from the water. In any other hotel, I would've been annoyed with children running up and down the halls, but that is what this hotel is made for! You just go with it. One evening we joined the pajama jammin' dance party before a bedtime story in the lobby. Wiley the Wolf helped lead the dancing and turned the storybook pages, which was a hit with all the kids. The next night we decided to close down the waterpark. It was awesome--no wait for the slides and hardly anyone in the wave pool. Lots of practicing swimming and hyping swim lessons for summer 2016. After completing our last quest to become master magi and another morning into afternoon at the waterpark, we let the kids pick out their last treats of the trip. 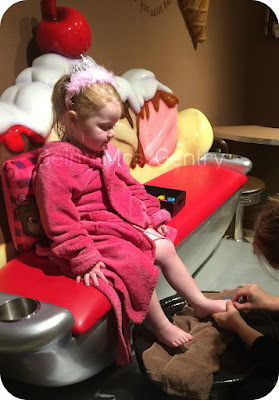 For sister, it included a trip to the little girls' spa, Scoops for a full service pedicure, complete with tiara and a scoop of ice cream. Brother hit up the arcade with Dad during girl time. 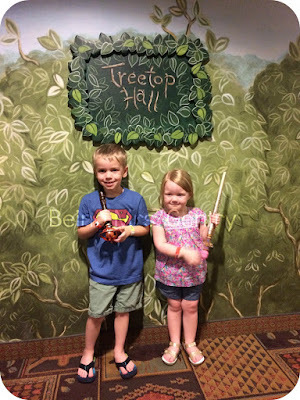 While our kids were a great age for the experience now, I can see where they would enjoy it even more as they are older, and I can't wait to do it again!